Hello Everyone! 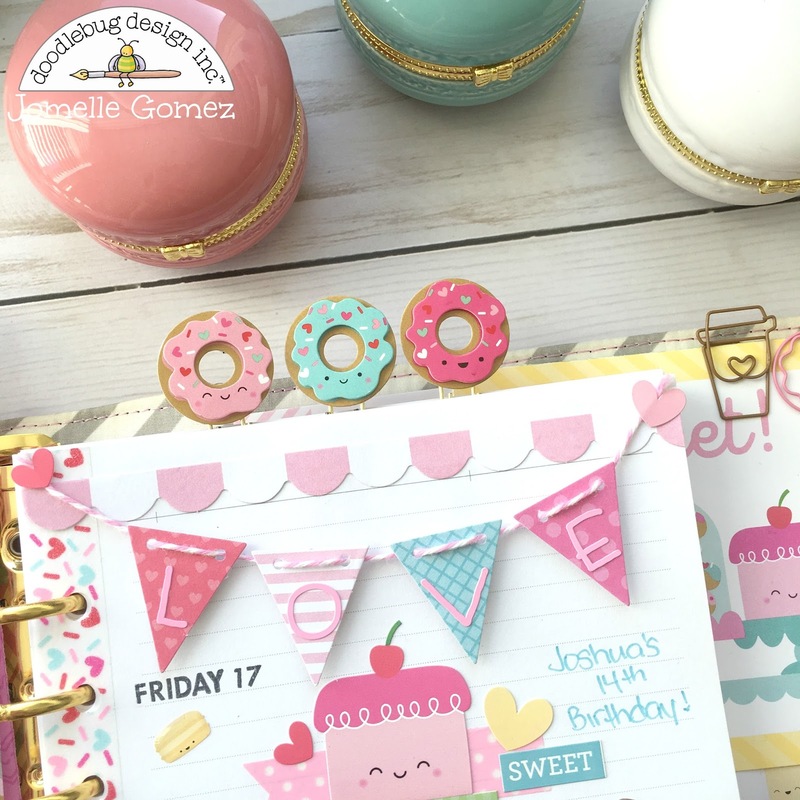 It's Jomelle today and it's my very first blog here at Doodlebug. 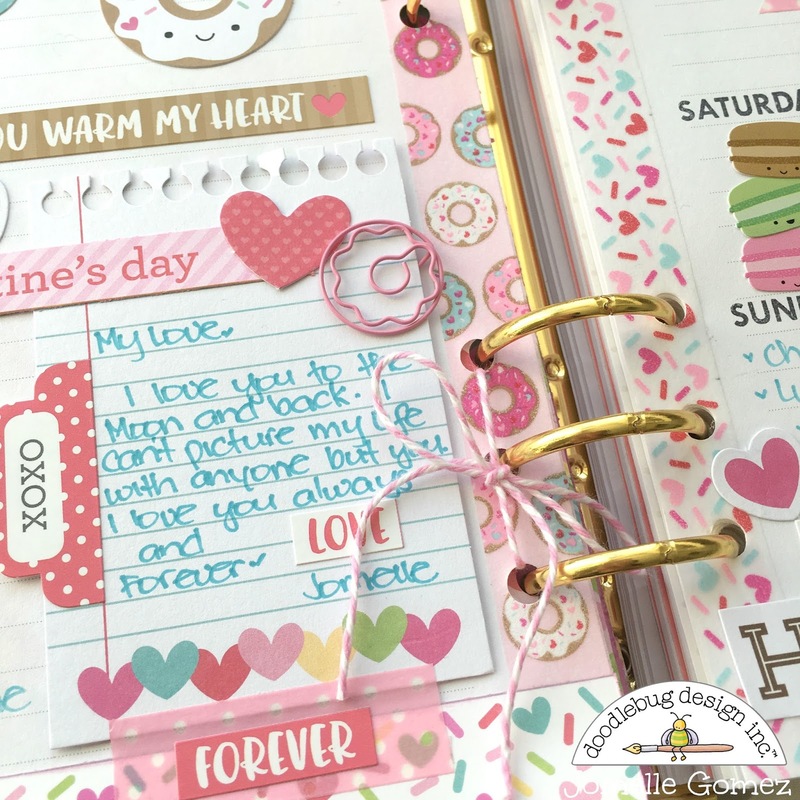 I am super excited to share with you what I have created in my A5 planner using the new Valentine collection Cream & Sugar. This collection is full of many cute and adorable embellishments. 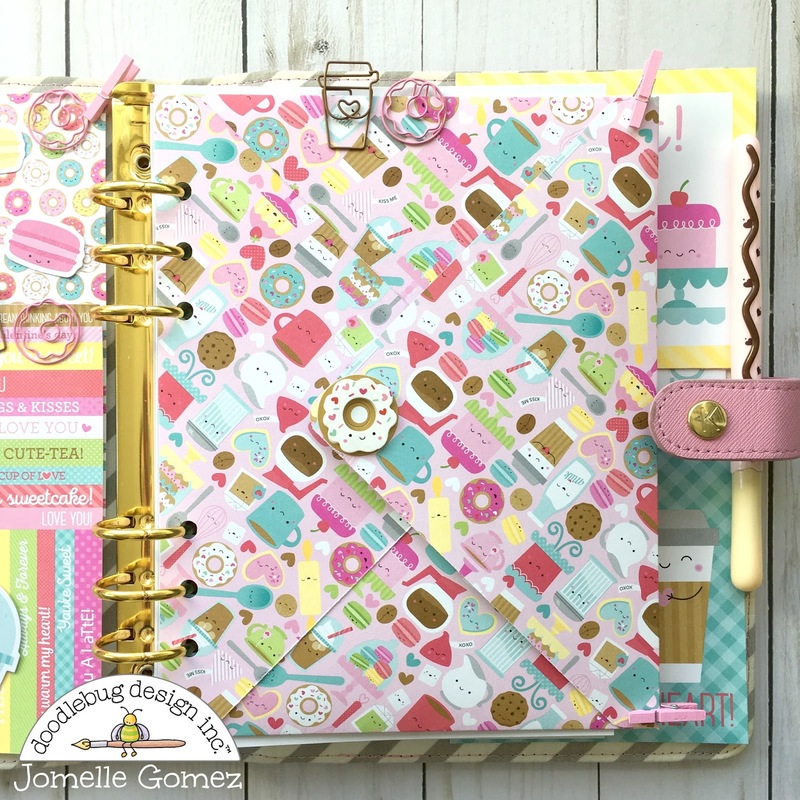 How could you not love the donuts and the coffee cup paper clips? As a planner girl, I love using the odds & ends embellishments to decorate my planner. Washi is also a must. I fell in love with the donuts and the coffee cups washi as soon as I saw them. 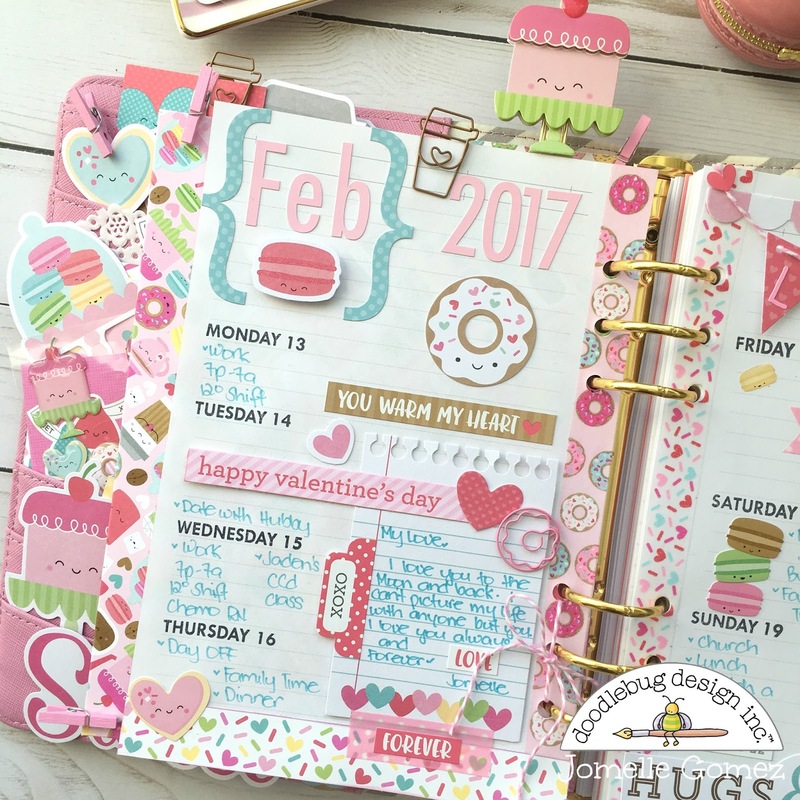 Every planner girl loves a beautifully decorated planner pockets. Here I used the odds & ends to stuff my planner pockets. I also used couple of doilies to add layers. The odds & ends comes with so many pieces that I can use them to decorate the whole month of February with this theme. 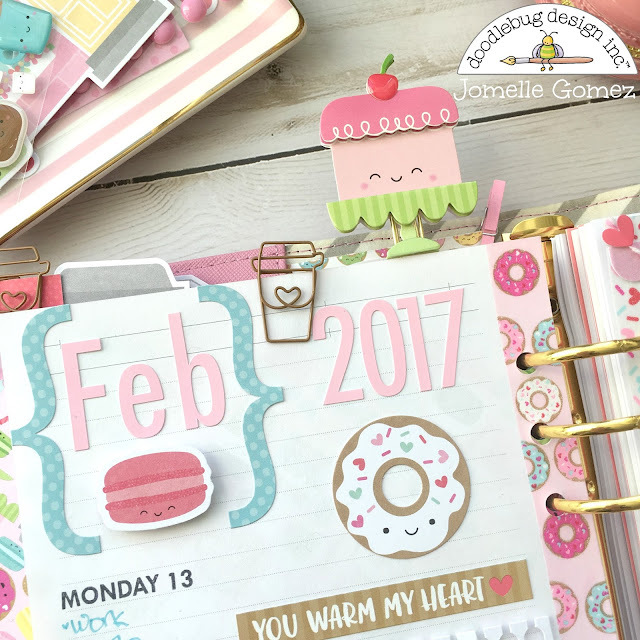 This is how I incorporate scrapbooking into my planner by making dashboards. I love having different dashboards decorated with different theme for all the holidays and seasons. I changed them out accordingly. I will use this Valentine dashboard for the month of February. I also used the twine to make a ribbon to add a little more flair into the dessert cart stand. I added some sprinkles and used doilies again to add more layers. 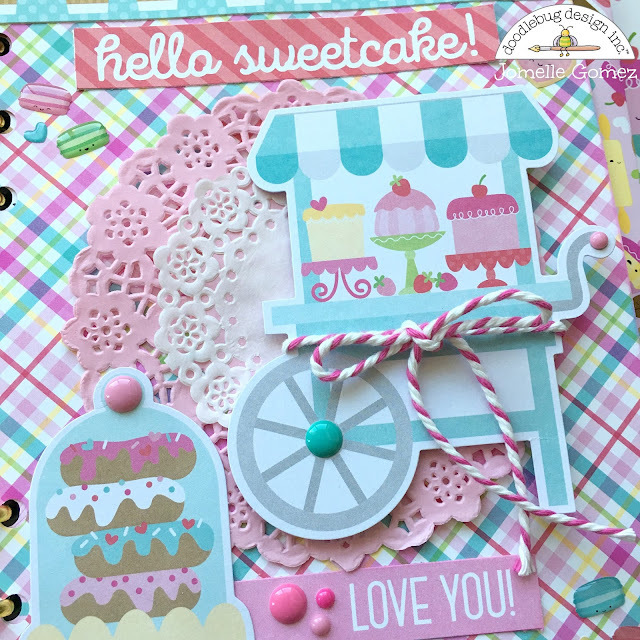 I made this 6x8 envelope using the "Creme & Sugar" 12x12 double sided cardstock. 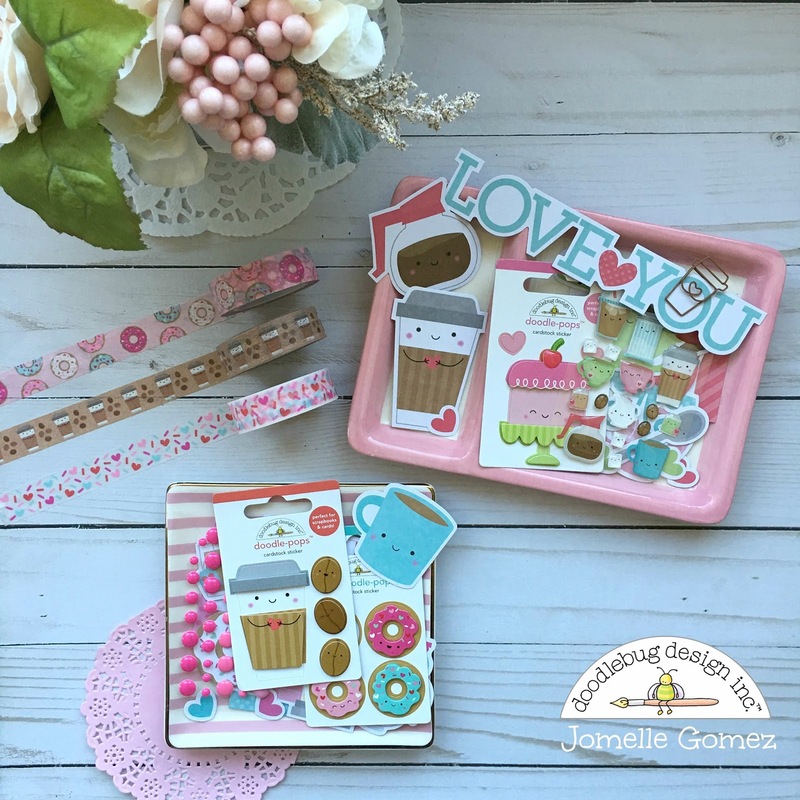 This super cute envelope can be decorative and also functional. It can hold my receipts, sticky notes, extra odds & ends and anything else I want to carry in my planner. Since the 12x12 cardstock was double sided, the inside of the envelope looks pretty as well when I open it. Here I inserted a doily in the envelope. I just can't get enough of the doilies. This is a close up of the dashboard to show the details. I layered couple of the doilies and added the cake cart stand piece from the odds & ends as a center point. Here is my weekly layout. I used a plain inserts and added the days and the dates. 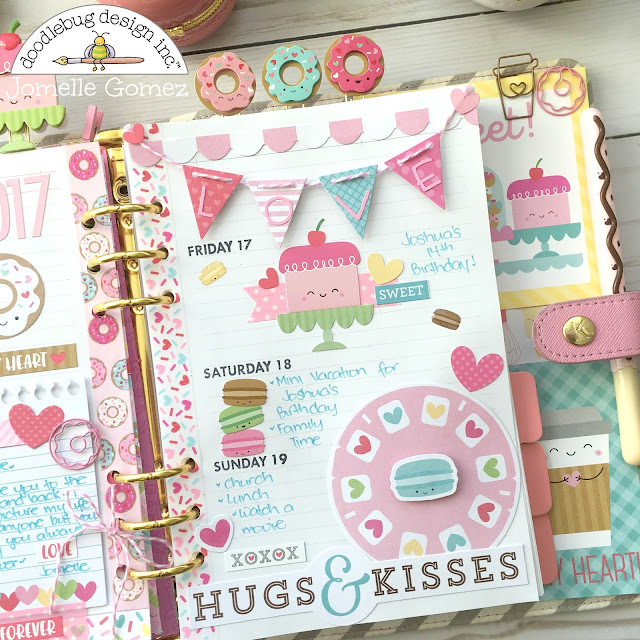 Close up of the first half of the weekly layout. Second half of the weekly layout. I used the mini donuts doodle-pops and made them into a paper clips. First I used a washi to adhere the paper clips and since the back is still sticky, I added a piece of paper on top of the washi. I used the banners from the odds and ends and added the letters to spell "LOVE" I used the twine to make it look like they're hanging. I did the same thing to the sweet cake doodle-pops. I added this little notepad and wrote a love letter to my hubby. Then I added a tab so that it can be pulled and flipped open so that I can either write more notes or I can add a picture. The ribbon I made using the twine just adds a cute detail. Cream & Sugar is my Favorite collection by far. I love all the pieces and all the adorable designs. The color scheme is very soft and very girly. I had so much fun making this project. This will not be the last of my projects using this collection as I just cannot get enough. 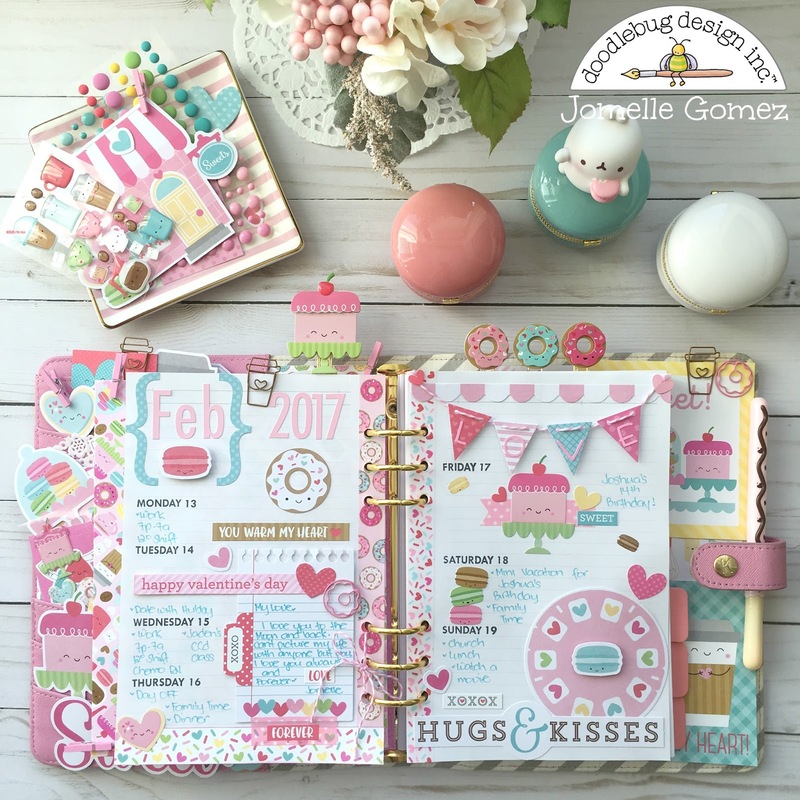 I hope you feel inspired after viewing my planner projects. Thank you for stopping by. This is so gorgeous and inspiring! Love!! Wowsers!! Cuteness overload!! Am so waiting with batted breath to get all of this line! Yes, favorite so far for sure!!! Goodness this is such wonderful inspiration!